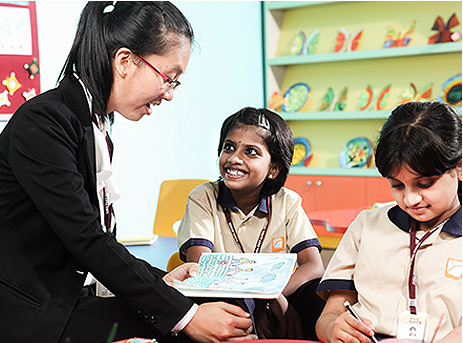 Aura Global School is a specialized initiative of Aura Academic Institutions Pvt. Ltd – a group desirous of making a cutting edge in the field of education. Founded with a vision to provide world class quality education based on the CBSE curriculum, we endeavor to be known for our excellence in teaching, by providing students with highest quality instruction within a state-of-the-art infrastructure and resources required for comprehensive learning and overall development, bringing out the latent talents of the students. Aura Global School, Perinthalmanna is the first one of over a dozen schools planned to be established in Kerala and Middle East Countries, as part of a massive initiative. A special feature of this school is its salubrious campus spread over an area of seven and half acres, enchantingly set in an amphitheatre relief surrounded by lofty hills in a sylvan milieu. Close to the town, but tucked away from the hustle and bustle, the school is located in a refreshingly tranquil and verdant ambiance, idyllic for learning. The emphasis is on attention to the learning, social and personal needs of individual students and the requirement is that students learn to think for themselves. Considerable emphasis is placed throughout the school on the development of personal qualities and virtues, including responsibility, accountability, self discipline, honesty, care and respect for others. Students are encouraged to participate fully and actively in the wide range of opportunities provided to suit their learning styles. Students are expected to be active participants in their own learning and are given opportunities and assistance to do so. To foster a society of individuals capable of progressive thinking, creating and initiating positive change in the social, economic and cultural fabric and to impact the global community through knowledge, understanding and attitude. To nurture individual talents and abilities by empowering all children and helping them develop into creative, disciplined and dynamic leaders of the future, who will be active global citizens contributing richly to our nation and the world and to raise them as independent, responsible, resourceful and successful individuals with high self-esteem and confidence. As a step forward towards providing international education to the citizens of tomorrow, Aura Academic Institutions Pvt. Ltd. decided to assay into setting up a chain of schools in Kerala under the brand name of Aura Global School. The school was founded with a vision to provide world class quality education based on the CBSE curriculum. Both Aura Academic Institutions and Aura Global School, marked the beginning of a journey with the launching event on 23rd January, 2012 at the Taj Gateway Hotel, Calicut. The honours was done by Padmashree M. A. Yousufali, Managing Director, EMKE Group. Aura group opened its flagship school in Perintalmanna in June 2012. The second school opened in Kodungallur in June 2013. Aura Global School is located in Panambi, Thazhekkod village, 4 km away from Perinthalmanna city. Perinthalmanna is an emerging city in Malappuram district of Kerala. It is a vibrant city with strong historical and cultural heritage and has many places of attraction for pilgrimage and tourism. Whilst Tirumandhamkunnu Temple and Thali Temple are the major places of pilgrimage, Kodikuthimala, Eravimangalam, Pathaikkara Mana, Olingara, and Kulirmala are places of tourist attraction. Perinthalmanna is known as city of hospitals. It has 4 super specialty hospitals including a Medical college and a number of small and midsized hospitals and clinics. As a result, a good part of the population consists of migrants from medicine-related fields. Pearson is our educational Partner for teaching material, assessment and training support in the primary section. Pearson is the world's leading learning company, with 40,000 employees in more than 80 countries helping people of all ages to make measurable progress in their lives. It is committed to a holistic approach to education. It begins by using research to understand what sort of learning works best, it continues by bringing together people and organizations to develop ideas, and it comes back round by measuring the outcomes of our products. Students today must be prepared for a dynamic, global economy-one that calls on people to use data more thoughtfully, think creatively, and work productively in teams. Continuous and comprehensive evaluation is a system by Central Board of Secondary Education in India to evaluate every aspect of the child during their presence at the school. This is believed to help reduce the pressure on the child during/before examinations as the student will have to sit for multiple tests throughout the year, of which no test or the syllabus covered will be repeated at the end of the year, whatsoever. The CCE method is claimed to bring enormous changes from the traditional chalk and talk method of teaching, provided it is implemented accurately.